Pound red chilli and pickled garlic until become fine paste. Add sugar, salt, pickled garlic juice, vinegar, mix well until smooth. Place over low heat until slightly boils. Remove from heat and set aside. Cut open whole chicken breast and spread out. 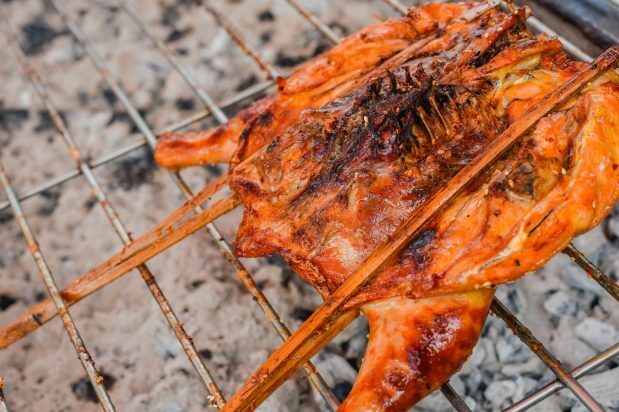 Insert the skewer through the chicken crosswise to spread out the chicken and place over charcoal grill with low heat until well cooked and brown both sides. Cut the barbecued chicken into large segments for serving with the 2 sauces with salads and/or steamed rice or sticky rice. The cashew tree is originally native to north eastern Brazil. Portuguese colonists in Brazil began exporting cashew nuts as early as the 1550s.